Keep an eye out on our racing index for all the latest news and the outcome of tomorrow's inspection at 8am. In the meantime, you can catch up on how Espoir D'Allen landed a shock Champion Hurdle win and the full story on the expected high winds. Thanks for your company - hope you backed some winners! Cheerio. Could tomorrow's racing be called off? In you missed it earlier... there is a lot of uncertainty about tomorrow's meeting because of expected high winds. Ian Renton, regional director for the south west region of The Jockey Club, has been speaking to Racing TV and says it was sensible to arrange an inspection for 8am tomorrow morning. He says it is impossible to predict how strong the winds will be, and from what direction, although with winds over 40mph forecast it could make for a dangerous situation. "We have been looking at this scenario for a few days now, so we have been able to put in some contingency plans," he said. "We feel being able to put on a full meeting on Saturday is infinitely better, to have a proper days racing, rather than extending Thursday and Friday to nine or 10 races." It is being reported that two of the three horses said to be receiving treatment are back on their feet, with one still down and being tended to. Le Breuil's winning jockey Jamie Codd: "Massive well done to Ben Pauling and his team. I picked up this ride fairly late last week and luckily he didn't have a rider. "It's worked out brilliantly. I hope everybody is up on soft/ heavy ground but this guy stays very well"
Ben Pauling, trainer: "Very special, gutsy. He jumped so well and travelled incredibly. What an amazing day." Some worrying news, however, with screens around at least three of the fallen horses as they receive treatment. Let's hope that there are no fatalities. What a crazy race. Le Breuil won by half a length as his stamina saw off Discorama. Third place? Jerrysback was 47 (FORTY-SEVEN) lengths behind. Only four horses finished the race. "I knew he'd stay but I didn't think he would stay that well. Gutsy," trainer Ben Pauling said. Le Breuil and Discorama surge clear... it is a two-horse race... neck and neck... Le Breuil digs deep and outlasts Discorama. This is not nice to watch... there have been several falls in this race, leading to a depleted field which Just Your Type still fronts. Final race of the day and a chance for amateur riders to take centre stage. 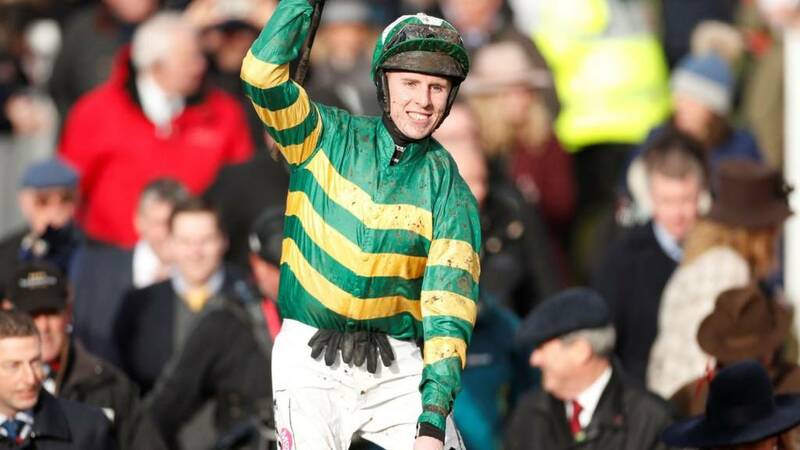 Impulsive Star for Sam Waley-Cohen could be one to watch, but the market is headed by Ballyward, trained by Willie Mullins and ridden by his son Patrick, and OK Corral from the Nicky Henderson yard and ridden by Derek O'Connor who has plenty of experience around the Cheltenham fences. It's not all glory at Cheltenham, you know - just ask jockey Jonathan Burke after he was unseated by his ride Glen Forsa during the Arkle Chase. Here's another look at racegoer Marc Nicholson's, ahem, dapper suit.